Stretching across 7.692 million square kilometres (of which 90% in uninhabitable), it’s no surprise that Australia's regional train networks play such a significant role in transporting people and cargo across the country. These lines are vast, running through shifting landscapes and large patches of nothing at all. As a crucial resource for regional communities and a major cost saver to freight companies (not to mention the environmental benefits), it quickly becomes hard to place a value on the service. In tribute to the great Australian rail network, we’ve compiled some of our favourite commuter routes from around the country. Australia’s largest regional transport operator, V/Line connects greater Victoria with the bustling state capital of Melbourne. For those seeking an outbound trip from Melbourne (if even for a day), we definitely suggest taking a look at the Bendigo line. Starting at Southern Cross station in the CBD, travel through vivid Footscray, Sunshine and Macedon. Disembark at Woodend for a traditional Aussie pub-meal and live music and have a wander through the charming country town. Hop on the next service and travel two stops to Kyneton. Here a similar kind of town awaits, boasting lush public gardens, antiques stores, cafes and vintage shops. Travel onwards and consider staying a night in the regional hubs of Castlemaine or Bendigo, both heritage gold-mining towns with a rich story to tell. Discover the sensational Blue Mountains on NSW TrainLink. Only a few hours from Sydney’s CBD, travel on an Intercity train through a sea of hazy green, rising above the tree canopies and into the horizon. Explore the mountain towns of Wentworth Falls and Blackheath, with fantastic bushwalking and country cafes to check out, before disembarking at Katoomba. Stay for a night if you have a weekend handy, and explore the regions hub. Cafes, pubs and galleries await, as well as stunning natural landscape. Experience the ancient Three Sisters rock formations in person and hop aboard the world’s steepest incline railway and Scenic Skyway at Katoomba’s scenic world. 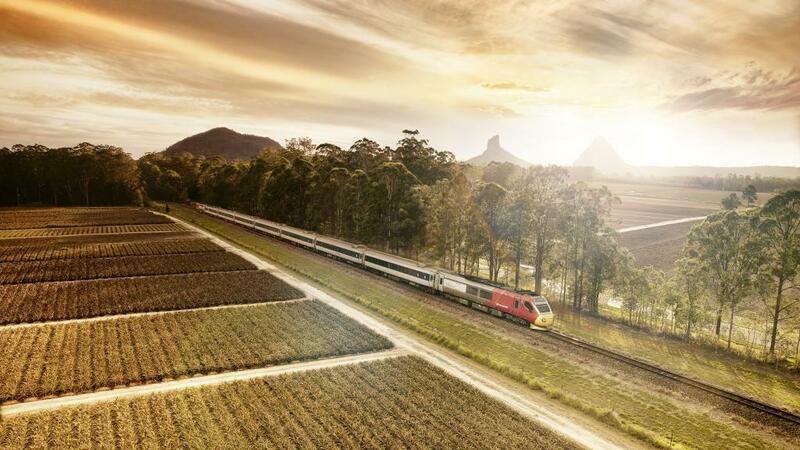 If you know anything about Queensland Rail, you’ll be familiar with the Spirit of Queensland route. Ferrying passengers from Brisbane to Cairns, this 24-hour trip runs five times a week and is an essential service for QLD residents. The door to world-renowned holiday destinations such as the Whitsundays, Townsville, Cairns and the Great Barrier Reef, experience this contemporary way to travel as you pass through shifting tropical landscapes, moments that will stick with you forever.